Blackpool Farm Cottage in Longhorsley, near Morpeth, Northumberland sleeps 8 people. Blackpool Farm Cottage near Morpeth is a detached, comfortable and spacious holiday home which is set on the edge of the owner’s working farm within lovely countryside, yet is within easy reach of the A697. The property has beautiful views and walks from the doorstep over to the village of Longhorsley. A lovely restaurant can be found within a mile. 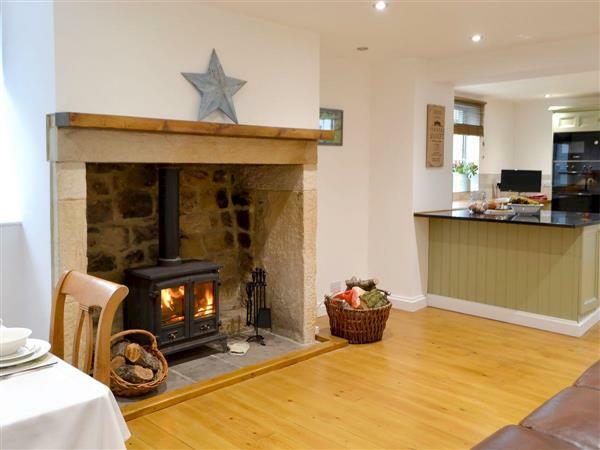 This large cottage has two wood burners, one in the living room and one in the kitchen/dining room, so ideal for cosy nights in. The small village of Longhorsely has a village shop and pub and is only 2 miles away. This is a great location from which to explore the many visitor attractions within easy driving distance. Alnwick Castle, featured in the Harry Potter films, is only 14½ miles away and is a great day out for all ages, Rothbury, 8 miles, has a pretty riverside and a nice selection of pubs and cafés, as well as the National Trust’s Cragside House. Druridge Bay is only 14 miles away, and Otterburn is 22 miles, where you can travel onto the acclaimed Dark Sky National Park, perhaps visiting Kielder. The pretty and historic town of Morpeth, 9 miles, has plenty of pubs and shops, as well as a swimming pool and rowing boat hire on the river. Trains can be taken, if you wish to leave your car behind, into Newcastle or Edinburgh from Morpeth for great days out. The Heritage Coast can easily be reached from here, where there are miles of unspoilt beaches peppered with castles. Blackpool Farm Cottage is great location for exploring the whole of this diverse and unspoilt county. The beach is 13 miles from Blackpool Farm Cottage near Morpeth. With the shop 2 miles, and the pub & restaurant are ¾ mile from Blackpool Farm Cottage. Living room: With wood burner, 42 Freeview TV and DVD player. Kitchen/dining room: With wood burner, electric oven, electric hob, microwave, 2 fridges, freezer, 30 Freeview TV and wooden floor. LPG central heating, electricity, bed linen, towels and Wi-Fi included. Initial logs for wood burners included, remainder at cost. Travel cot and highchair. Lawned garden with sitting-out area and garden furniture. Bike store. Private parking for 4 cars. No smoking. Please note: There is a fenced stream in the grounds, 300 yards away. Holidays at Blackpool Farm Cottage run from Monday to Monday. For a better idea of where Blackpool Farm Cottage is, you can see Blackpool Farm Cottage on the map below. Blackpool Farm Cottage is in Northumberland; should you be on the lookout for a special offer, you can find all the special offers in Northumberland. It's always worth checking to see what is on offer at the moment. Do you want to holiday near Blackpool Farm Cottage (UK3210), you can see other cottages within 25 miles of Blackpool Farm Cottage; have a look to find your perfect holiday location.